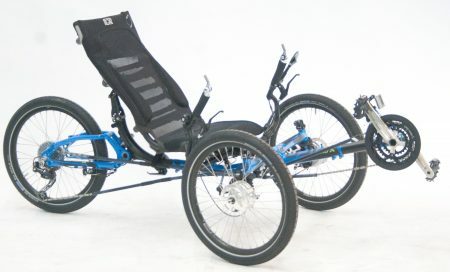 Except for bikes with more extreme reclined positions, Lightning Cycle Dynamics builds some of the world’s fastest recumbents, and some of the best climbing ‘bents too! 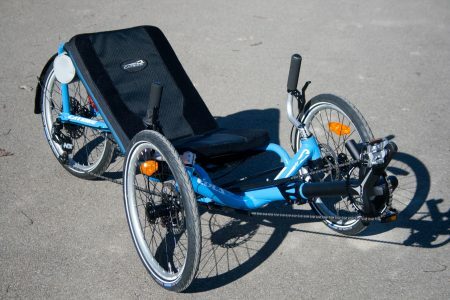 All Lightning recumbents have Over-Seat-Steering (OSS) and share a similar short wheelbase (SWB) design. Riding a Lightning puts you in a pretty aggressive stance, ready to power up the next hill. The Bicycle Man is the largest Lightning dealer in New York State. We stock the Lightning P-38, Phantom and Thunderbolt recumbents. Note: The Lightning Thunderbolt is permanently out of production. We do not have any left. The Lightning seat is one of my favorites; its nylon mesh and cantilever design provides “passive suspension,” absorbing road shock without an added weight penalty. Riders over about 230 LB may have a durability problem with the Lightning seat. 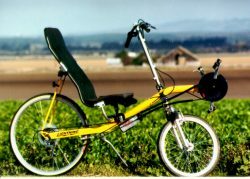 Tim Brummer designed Lightning bikes to keep your weight optimally centered between the wheels whether you are tall or short. Instead of adjusting the seat, on a Lightning bike you adjust the bottom bracket/pedal position (like recumbents from Haluzak, Reynolds and HP-Velo.) Their optimal weight distribution and moderately short wheelbase combine to deliver maneuverability and lively handling. “U” turns are pretty easy, though you may have a bit of heel interference. Dr. David Smith, MD, Bicycling Magazine. Some riders find Lightning’s high-speed stability a bit too quick, particularly on the P-38. The P-38 is a bit more nimble and takes more getting used to at high speeds. The adjustable bottom bracket makes adjustment to different riders awkward; you sometimes need to change the chain length also. 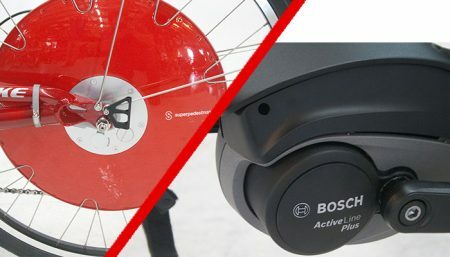 For owners who want to share their bikes with riders of different height, there is an optional chain tensioner available though I haven’t found this to be a perfect solution. The P-38 is one of my favorite bikes; I sit high enough to see in traffic, I’m very comfy and it climbs great! No recumbent will be fast on your first ride. It will take a while for your muscles to become accustomed to the different position and develop an efficient pedaling cadence. After one month on a Lightning most riders equal or surpass their old bike’s performance. After two months of regular riding they should be ready to climb as well as on their old bike. If you are accustomed to mashing big gears on hills, you may need to learn to gear down and spin. Over the past 20 years, the Lightning speed advantage has been demonstrated in race after race. In 1995 Lightning bikes won four stages of the prestigious ~2,000-rider Paris-Brest-Paris race. 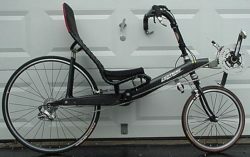 (The first recumbent bike to compete in Paris-Brest-Paris was an Avatar 2000 currently in my collection.) 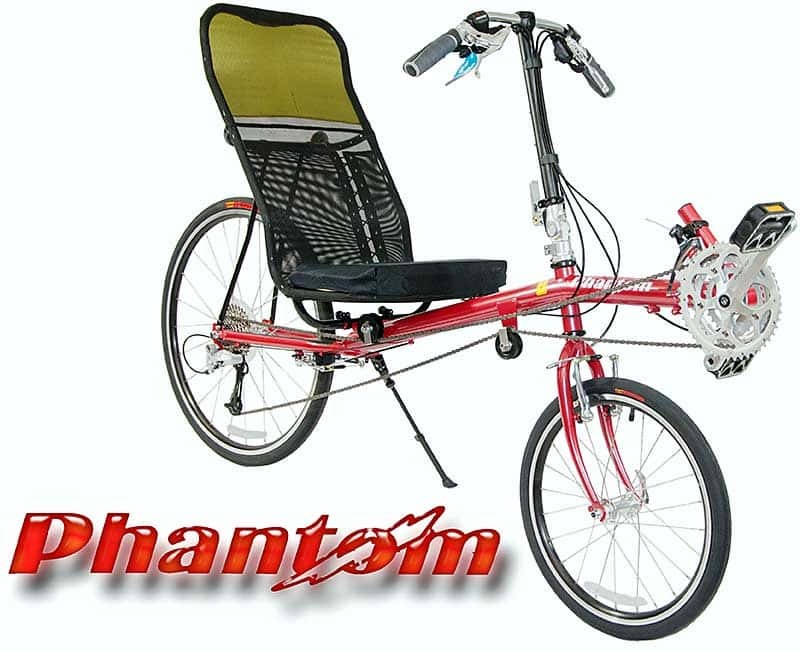 This speed advantage is largely due to the riders recumbent position, with its lower wind resistance. Combined with the P-38’s 25-lb. weight and stiff bottom bracket; you have a pretty hot setup. 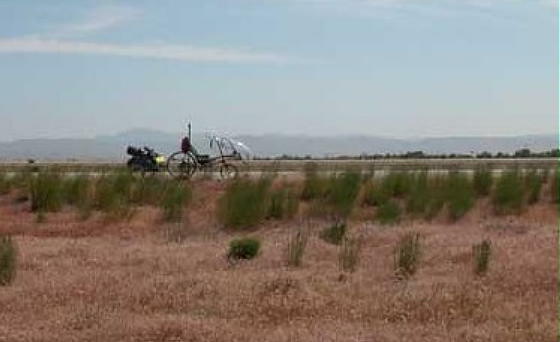 As with many SWB recumbents, your heels may hit the front wheel during slow, sharp turns. This only occurs below ~5 mph and is less of a problem for riders on the smaller Lightning sizes, which use a 16″ front wheel. With a little practice you can easily make a safe “U” turn. To make this even less of a problem, pedal extenders are available. Because Lightning bikes adjust the pedals rather than the seat to fit the rider this poses less of a problem for tall riders. If you like lots of seat recline angle, be aware that the range available on Lightning bikes is quite limited and isn’t easily modifiable. 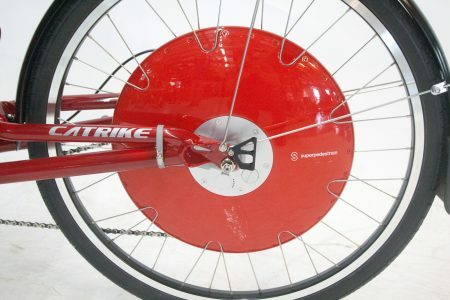 Aerospace engineer Tim Brummer designed Lightning bikes to last for many years of hard usage, All Lightning frames are covered by a 5-year warranty. Tim’s resume includes: detail design of the Space Shuttle and B-1 supersonic bomber, Composites Engineer for Hughes Aircraft, and launch operations for the giant Titan rocket booster. “I have a confession to make; I have been cheating the whole trip. 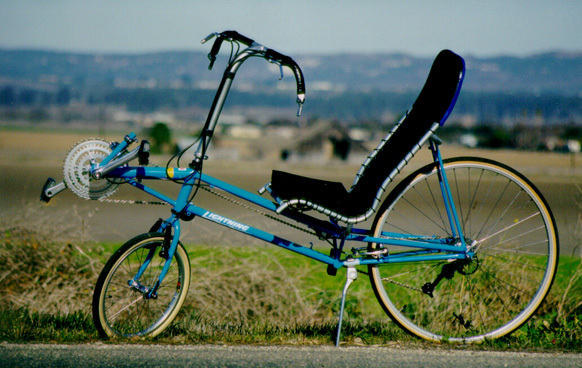 I am riding a Lightning P-38, a recumbent bicycle. Instead of being hunched over the handlebars, I sit back. Instead of cramming my body on top of a skinny seat, I sit in a chair. I still have to pedal, but this bike almost makes it too easy. This bicycle is completely different from anything I have ridden before, as if someone took the complaints about bicycle comfort and actually listened to them.” IAN Babbit, Portland ME to Portland OR on a P-38 towing a Burley trailer.